When choosing the optimal detection system for your application, consider not only the species of the primary antibody but also the species of the tissue under examination. If the species of the primary antibody and the species of the tissue are closely related (for example, rat and mouse), the secondary antibody may cross-react with endogenous IgG in the tissue section. This can lead to background staining. For the two-step ImmPRESS Excel Amplified Polymer Staining Kit, the species of the Amplifier Antibody (made in goat) should be considered in addition to the primary and tissue species. Use a secondary antibody specifically adsorbed to remove cross-reacting antibodies of closely-related species (for example, ImmPRESS Anti-Mouse IgG, Rat Adsorbed). Use ImmPRESS® VR Polymer Detection Reagents, which eliminate off-target binding and thus increase signal specificity in these animal tissues: bovine, goat, sheep, swine, horse, cat, dog, rabbit, rat, mouse. Since the Amplifier Antibody in both the ImmPRESS Excel Anti-Mouse IgG Kit and the ImmPRESS Excel Anti-Rabbit Kit is made in goat, these kits are not recommended for goat, bovine and sheep tissue - the ImmPRESS Excel Polymer Detection Reagent (an anti-goat IgG) may cross-react with endogenous immunoglobulins. 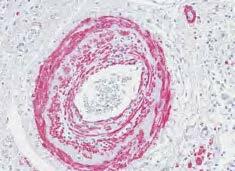 Lung: aSMA (m), ImmPRESS-AP Anti-Mouse IgG, ImmPACT® Vector® Red AP Substrate. Counterstained with Hematoxylin (blue). Image kindly provided by the Centre for Inflammation and Tissue Repair, University College London. 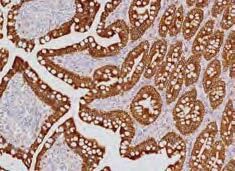 Canine small intestine: Cytokeratin (MNF 116), ImmPRESS™ VR Anti-Mouse IgG and Vector® DAB Substrate (brown). Counterstained with hematoxylin (blue).